You've just purchased your shiny new Samsung Galaxy Note 5. You're excited to get your hands on the included S Pen so you can select, edit and jot with the fancy stylus to your heart's content. But wait ... which way will you put it back into the phone once you're finished? You don't remember! Thankfully, Samsung has taken measures to spell out which end is which for new Galaxy Note 5 users. Packaging on freshly unboxed units come with a sticker on the phone's screen that clearly displays how to do it: put the S Pen back in nib-first. Putting it in backwards could lead it becoming jammed inside the device, potentially damaging it when extracted again. Once more for the back row: When finished using the S Pen with your Galaxy Note 5, place it back inside front-first, just like it was packaged. 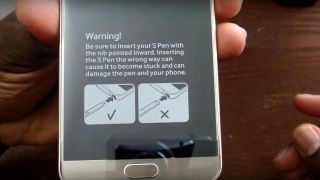 Do not insert the back end into the phone, as it could jam or disrupt features that detect if the pen is in or not. Putting in the S Pen from the side is right out. All joking aside, inserting the pen incorrectly could cause permanent damage to the phone. While it seems like the sort of thing to be left up to common sense, we can't argue with any measures taken by Samsung to prevent users from prematurely damaging their phones. Have you upgrade to the Galaxy S6?